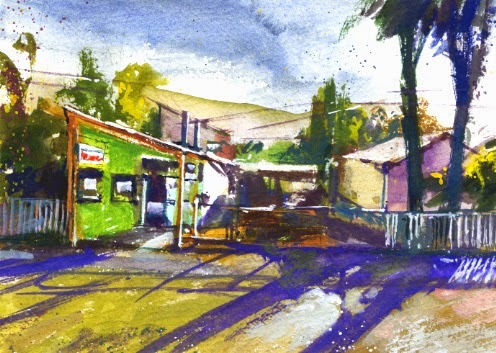 Virtual Paintout - Southern Chile! 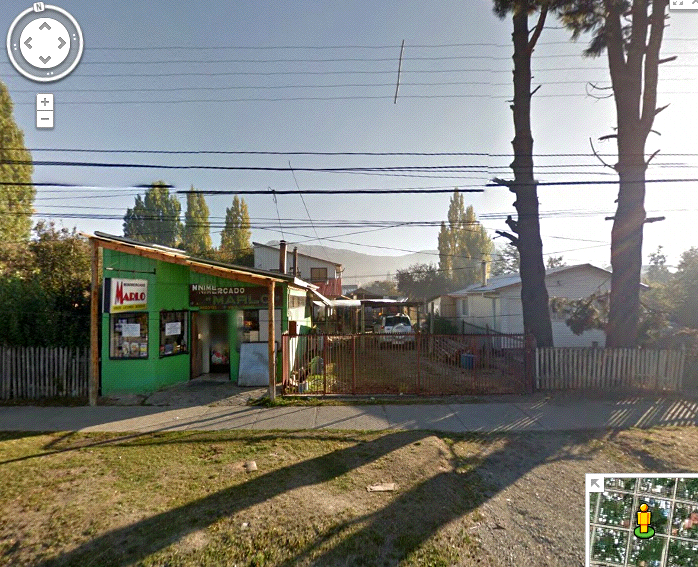 The Virtual Paintout for May 2014 was the southern parks area of Chile. 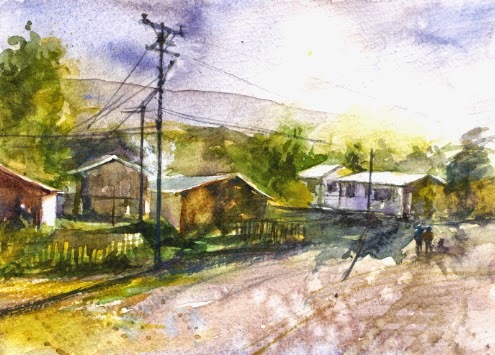 Created by Bill Guffey, artists use Google Street View in the month's chosen area to find their views to paint. Just like plein air painting (sort of... no hot sun or dogs drinking my watercolor water, etc.) but online. I really enjoy it since I'll never get to see all of these locations in person. It's really fascinating. I must say, I saved more views from this area than I have for any other virtual paintouts, and I only looked around two towns and a little countryside. Almost everywhere I looked, the light was amazing. 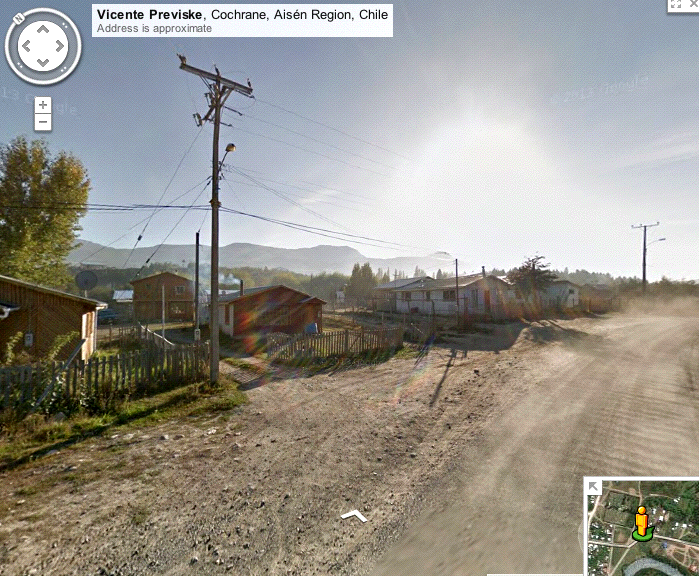 I don't know if this was because of the time of day the photos were taken or the way the sun looks in southern Chile. It was hard to choose just two views to paint. Looking forward to the June location! A few weeks ago I returned to paint at the Brand Library in Glendale. 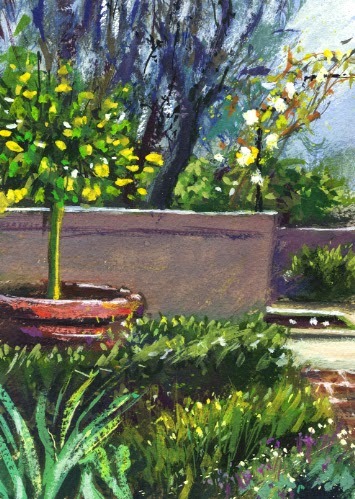 It was two years ago when I painted a watercolor and posted it in Plein Air in Glendale. At that time the library had just closed for a big renovation. Two years and $10 million later the library is reopened and stunning. The 1904 former private residence, called El Miradero, has always been an unusual building in Glendale with its exotic Eastern architecture, and now it's so exciting to revisit and appreciate all the improvements. One of the painters in our group was on the architectural team specializing in authentic, historic, styles. It was great to walk through with him for his knowledge of the renovation. I painted a gouache because with it I can go back and forth with areas a little, which I thought I might need to do considering the fancy, notched arches. The driveway entrance looking west from the library. One of the paint-out groups I'm in has a member who does outdoor plant maintenance at private residences. Because of our fellow artist's connection, last month the group was able to paint at one of her client's homes. We were so lucky to have such an opportunity. The home is on an exclusive street in a very lovely area of Pasadena. Our group was looking forward to our day and the location did not disappoint. There were several garden areas surrounding the house and other buildings on the property. I had a hard time choosing what to paint. I finally decided on one of the intimate patio areas outside some pretty French doors. The morning started out very overcast so I tried a gouache piece. The sun came out for a brief bit of time and I gathered a lot of information on adding some light. I was surprised to see the top of the wall I was painting became white when the sun was shining. The homeowner was happy to have our group there and she even provided a wonderful lunch for us. I'll be sending her a print of my painting. The pond on the other side of the wall I painted. View across the street over iceberg roses lining the walkway. 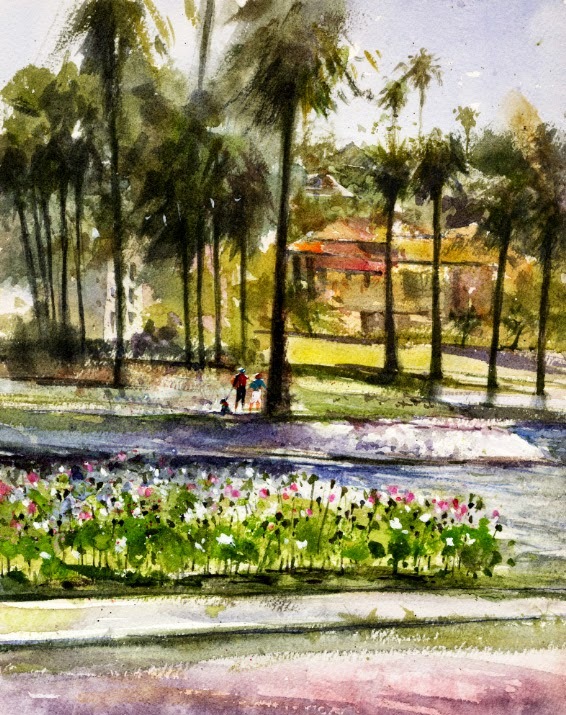 I haven't painted in Pasadena's Central Park since early last summer. The park has a great view of the famous and distinctive old Castle Green Hotel. This was my fourth time painting the hotel. I painted a gouache piece on my last visit and posted that in Castle Green Revisited. I wanted to try a watercolor again and it was a beautiful day there. The sun was out so we had some shadows on the hotel to add interest! The park was busy in the morning where I was sitting, with a private trainer and his client, lots of loud grass mowing, and squirrels. I feed some squirrels at home and it seems the squirrels in the parks know this and hang around looking at me for a hand-out of nuts. Maybe on our next paint-out at the park I'll try a view of the lawn bowling, and bring some peanuts of course. The lawn mower waiting for the artists to leave. One last spot! 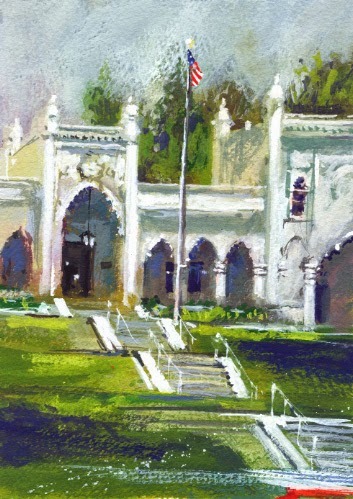 A paint-out last month was at the Pasadena Museum of History. I painted there a year ago with another group and posted that watercolor in Another Museum! Most painters were taking on the main museum building, a 1906 Italian Villa which didn't appeal to me. Maybe next time. A pair of mallard ducks that were spending the morning at the beautiful birdbath caught my eye. The day started out overcast again so I tried a small gouache. Both ducks flew off but soon the male returned. He kept leaving and returning, seeming to check if his friend was there. She wasn't. I decided to add him to my gouache piece even though ducks are usually in ponds, not small birdbaths. I hope the two got together later that day! Wow, I'm still behind posting paintings. 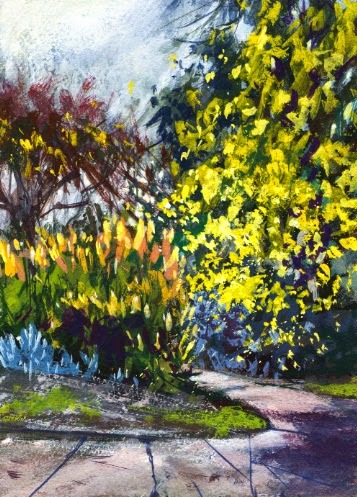 This gouache piece was painted in March at our local arboretum. 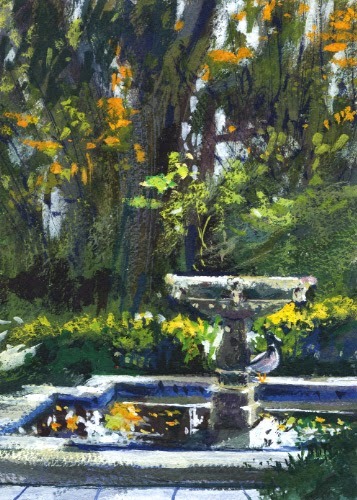 My last blog post of an arboretum gouache was Arboretum in January. One of the plein air groups meets there every quarter to plan our next locations so we had our latest planning session in March. It was only a short walk through the still-blooming aloes when I saw this yellow trumpet tree. It was covered with yellow flowers. So pretty! I had to try it in gouache. The tree was a very popular spot for photos that day. My last post was a watercolor I painted then hadn't posted here. 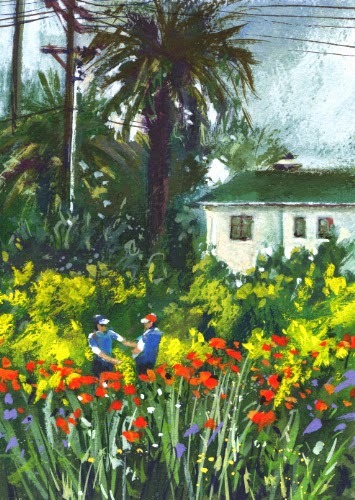 This is a gouache piece I painted a month or so ago at Arlington Garden before the red poppies started blooming. It started off as an overcast day, no sun, no shadows. No red poppies yet. I found this nice arrangement of potted plants and thought they would be fun to try in gouache. Gouache dries faster than watercolor, and with no sun, that was another deciding factor. In my photo you can see a bit of a pretty espalier against the wall that really caught my eye but I didn't have room to include it. The sun came out when we were finishing up so I took a photo to be able to add some shadows later. 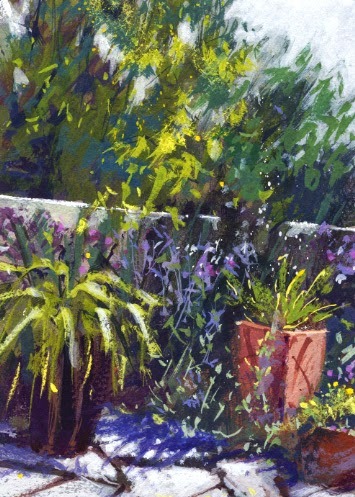 I'll be back again to paint in this small area of Arlington Garden. Over the years it's been great to visit Echo Park, near downtown Los Angeles. It's an old park and it has a large lake. A main attraction for most people are the lotus plants which have been a spectacular sight in the lake since the 1920's. There is an annual Lotus Festival. Sadly, several years ago the plants died off. There wasn't agreement on the cause but everyone wanted the lotuses back. That finally happened last year. Of course we had to paint at this beautiful park! There are wonderful views of downtown Los Angeles in the distance, and the lotuses have returned. 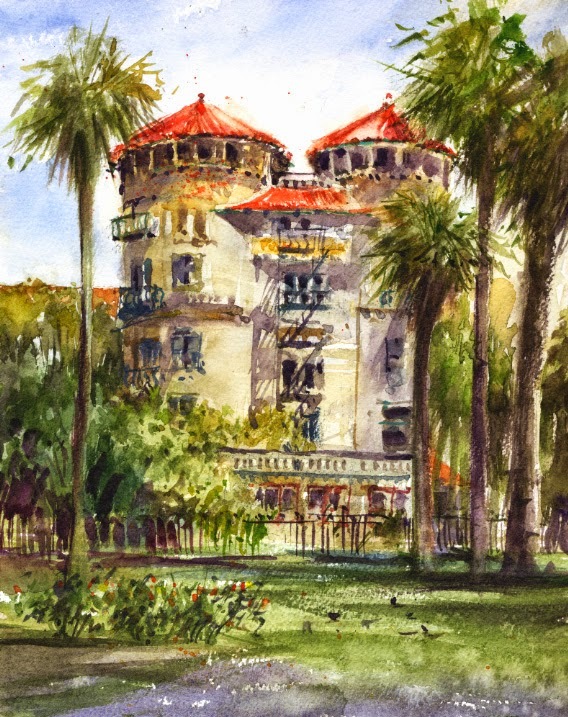 We painted there last August and I hadn't posted this watercolor. I also started a gouache piece but didn't finish. Now, this month the park is on the paint-out schedules of all three plein air groups I'm in. So, I'll share my watercolor and finish my gouache piece this month to post another time. In August the lotuses were just starting out and had a net covering them. They grow to five feet high so I'll be anxious to see how they're doing now. There were three mud hen chicks in the moss under the lotuses. Last Friday may have been my last chance to paint the red poppies at Arlington Garden this year. We're having some hot weather so they may not last, although the plants do have a lot of buds. I posted my previous poppy pieces in The Red Poppies! The morning started out slightly overcast but quickly got warm. It was very busy that day with artists, a therapy group, and workers getting the garden ready for Pasadena's Open Days Garden Tour that weekend. Three of us from the Friday plein air group were there. I found a spot under a tree with a view across the street with the red poppies in the foreground, and painted while watching the activity with many wheelbarrows full of top soil coming in. Maybe I can get another spring poppy painting in soon!